If you face any errors while creating dashboards in the dashboard designer, you can collect the following log files generated in the app data location and share the log files to the Syncfusion support team by creating a DirectTrac incident along with the detailed explanation about the issue and query for quick and better solution. 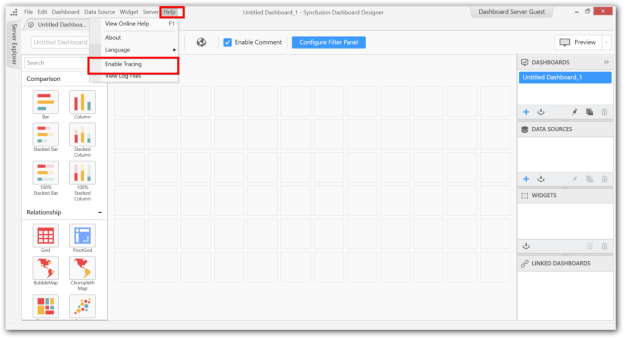 Syncfusion Dashboard Designer generates the following log files in the app data location for analyzing and troubleshooting the error while working in the dashboard designer. Any error occurred, while working with the Dashboard Designer, it gets logged in the error log file. Not only the errors from the application get logged here, but also some generic errors such as data connection errors can be occurred due to the network failure. The User Interactions and some debug information can be logged in a .log file, when the Enable Tracing feature available in the Help menu is enabled. Enable Tracing: By default, logging the events will be disabled. You can enable the logging state by clicking the Enable Tracing option. The tick mark will be shown, if the logging is enabled. The settings will be remembered when the application is launched the next time. The events will be logged automatically, if tracing is enabled. In addition to the trace log file, another log file called RecentDashboardLog.log will be available in the same folder that contains information about the recently opened dashboard file. Clear the existing log files from the below app data locations (Keep your dashboard designer application closed during this time). 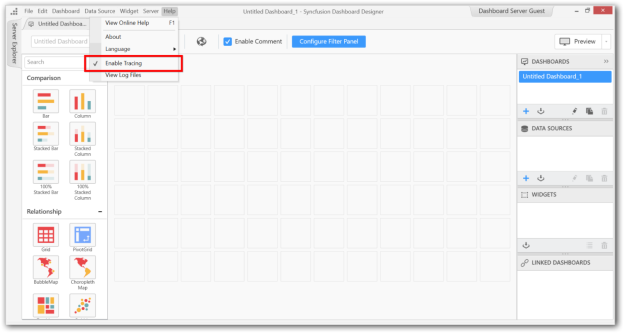 Open your Syncfusion Dashboard Designer application and enable the event logging. After the logging has been enabled, open the dashboard file in the issue, which you are facing (design the dashboard in which you are facing the issue based on your problem), or continue till you reproduce the issue. After reproducing the issue, stop further interactions with the Dashboard Designer. Get the following log files from the app data location and share the files to Syncfusion support team through a support ticket in the Direct-Trac. If file size exceeds it will be rolled into new files with the extensions like TraceLog_Month_date_year_mm_ss.log.1, TraceLog_Month_date_year_mm_ss.log.2, TraceLog_Month_date_year_mm_ss.log.3 etc.. If the reported issue is being complicated, please attach an error screenshot or video, replicating the issue, for better solution at earliest.